Grúpa radacach ar son leas na cosmhuintire agus na teanga dúchais atá i Misneach. Ní hionann muid agus mórán eagraíochtaí eile i saol na Gaeilge nó ní chuireann muid fiacail ann ó thaobh na polaitíochta de. Is den eite chlé muid agus creideann muid go daingean go gcaithfear an córas caipitleach agus an t-impiriúlachas a chur de dhroim an tsaoil ar mhaithe leis an Ghaeilge, agus go deimhin, mionteangacha agus mionchultúir an domhain mhóir, a thabhairt slán. Anuas air sin creideann muid gur féidir leis an Ghaeilge cur go mór leis an streachailt ar son chuid cearta an luchta oibre, sin le rá gur cuid thábhachtach de réabhlóid ar bith in Éirinn atá inár dteanga dhúchais. Diúltaíonn muid don bharúil gur faoin stát agus faoin aos pholaitiúil atá sé an Ghaeilge a thabhairt slán ón fhaopach. Oibríonn Misneach ar thrí mhór-dhóigh: an fheachtasaíocht, an t-oideachas agus an tógáil pobail. I dtaca leis an oideachas agus an mhúscailt feasachta de is é atá i gceist againn go bhfuil sé mar aidhm againn aird a tharraingt ar an Ghaeilge sa saol comhaimseartha. Déanann muid sin tríd chainteanna agus díospóireachtaí poiblí a eagrú ina mbíonn béim ar an dearcadh réabhlóideach den eite chlé. Scaipeann muid an tuiscint i measc an phobail go bhfuil an Ghaeilge de dhíth orainn mar chuid den streachailt dí-choilínithe. 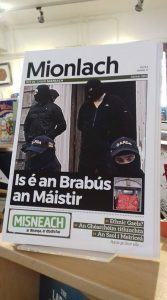 Ag díriú ar lucht na Gaeilge a bhíonn muid ar mhaithe le muid a chur ag caint le chéile agus ag forbairt ár gcuid smaointí ar an bhealach chun tosaigh dúinn mar phobal. Ach chomh maith leis sin, agus nuair a bhíonn na hacmhainní ar fáil ag an leibhéal áitiúil, cuireann muid ranganna Gaeilge ar fáil do chomrádaithe atá báúil lenár gcúis.